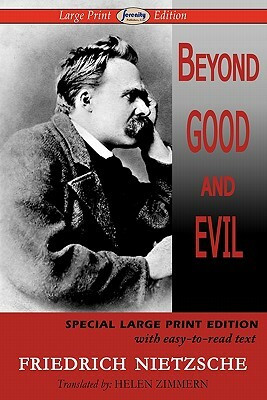 Beyond Good and Evil is a book by the German philosopher Friedrich Nietzsche, first published in 1886. *** It takes up and expands on the ideas of his previous work, Thus Spoke Zarathustra. In these works, Nietzsche questions the value of truth and knowledge, espousing the view that "facts are precisely what there is not, only interpretations." In Beyond Good and Evil, Nietzsche moves into the realm "beyond good and evil," in the sense of leaving behind traditional morality. *** This is a special large-print edition of this classic work.